Triak Sailing Kayak from Triaksports. Paddle or sail this kayak. Triak Sailing Kayaks are fantastic. My friends at Triak sports make a great little sailing kayak. Now, this is not just a kayak retrofitted with floats and a sail. 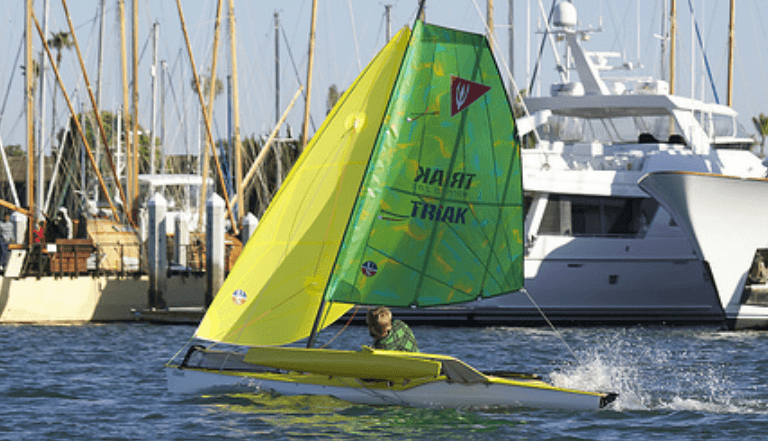 The Triak was designed from the ground up for equal parts sailing performance and smooth, fast paddling. I have been following the Triak brand for over 10 years now. The TRIAK boat was originally designed by Canadian Charlton Bullock in 1999. Mr. Bullock came from a strong sailing background and by trade designed world champion International 14’ dinghies. As his passion and design grew to include sea kayaking, the TRIAK emerged from his creative genius resulting in a craft that was superbly balanced in both sailing and paddling with a truly aesthetic blend of form and function. A few years back TRIAKsports hired the nautical design team of Morrelli and Melvin, one of the world’s best multihull design firms. Working with Morrelli and Melvin, they redesigned the Triak from top to bottom. Modernizing the sailing rig, floats and foils was the major part of the latest upgrade. This boat is fast, loads of fun, and the most versatile trimaran sailing kayak on the market. I would even say there is no comparison to any production sailing kayak out there, they just don’t exist. This boat is expedition Tough with a quality finish. All first rate quality fiberglass construction. One of the best things about the Triak for me is the “Cool Factor”. This boat is easy to paddle and because it has outriggers you will have lots of confidence on the water. It’s great to look at, and when you want to GO pull the chute and you can set a spinnaker. How many kayaks have you seen that have a full on reaching spinnaker. Speaking of chutes and spinnakers they have recently developed a beautiful new snuffer system that works flawlessly. Keep it coming guys, it’s great to see these new developments working and improving on a great design. Included with your new boat are North Sails, a Ritchie Compass, and Harken Hardware. The Triak is easy to car top so you don’t need an expensive trailer, license and upkeep that go along with other boats. All the parts go together fast and without any tools. Congratulation also to team at Triak for being in Sailing World Magazine as a nominee for the 2011 Boat of the Year award. This is a big deal if you look at all the sailboats both big and small included in this group annually. You can see why they have a reason to be proud of their boat. Last time I spoke with the owner I told him to reserve a Triak Sailing Kayak for me. This will most likely be my next boat upgrade. Go to Triaksports to find out more. Interesting, I do a lot of kayaking and have never seen a sailing kayak. We do lots of kayak fishing, not sure if these would be the best to fish off of. But look like they could be a good time. You are probably right. These wouldn’t be the best to fish from because these sailing kayaks can’t sit in one place for very long. They are always on the move. All the more reason to try one, they are adrenaline rushing boats with non-stop action. If you get to try one out, let us know what you think!